The Green House is a contemporary three bedroom detached property with lots of lovable quirky features in a fantastic location in the village of Brandon, a small village with lots of life just 20 minutes drive from Dingle. The open plan, split level house lets in lots of light and has a large unique living area ideally suited to relaxed holiday entertaining. Stylish and comfortable, there is a wet room with a pressurized shower and underfloor heating. The Green House has panoramic sea and mountain views, is 1 minute walk from the beautiful Ballyguin beach and 3 minutes walk from Brandon Pier where you can have a drink at the legendary Murphys Bar overlooking Brandon Bay, the longest beach in Ireland. The house is beautifully furnished surrounded by a colourfull established garden..
Mount Brandon dominates the villages of Cloghane and Brandon, a welcoming community with a rich heritage of music, language, and dance. There are numerous walks to lakes, waterfalls, creeks, beaches, cliff walks and of course the unforgettable walk/climb up Mount Brandon. Cloghane has two great bar/ restaurants serving pub food O’connors and O’Donnells. Brandon is centred around the activities of the Pier, swimming, fishing, drinking, eating, dolphin spotting, socialising. It’s a very special place and in the summer months full of activity with kids and sometimes adults jumping off the Pier, hiring boats, rowing curragh’s (traditional Irish boats made of heavy canvas and tar). Murphys bar is on the Pier overlooking the Bay, there is also Mullalies and Cathy’s bar round the corner. Mullally's serves food all year round every day. 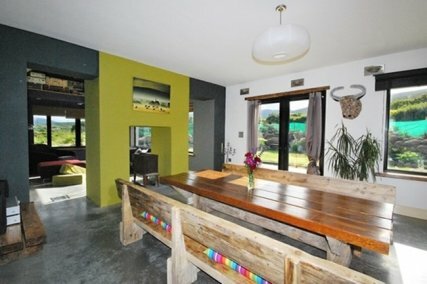 The Green House is a contemporary three bedroom detached property with lots of lovable quirky features in a fantastic location in the village of Brandon, a small village with lots of life just 20 minutes drive from Dingle. The open plan, split level house lets in lots of light and has a large unique living area ideally suited to relaxed holiday entertaining. Stylish and comfortable, there is a wet room with a pressurized shower and underfloor heating. The Green House has panoramic sea and mountain views, is 1 minute walk from the beautiful Ballyguin beach and 3 minutes walk from Brandon Pier where you can have a drink at the legendary Murphy's Bar overlooking Brandon Bay, the longest beach in Ireland. The house is beautifully furnished surrounded by a colorful established garden. In the booking steps you can add surf lessons from any of our certified surf school partners below. The surf school will either pick you up at your accommodation or meet you at the nearest beach as detail in their profile below. The surf school will always contact you the day before to arrange the exact time of your lesson and meet up details. Due to changing tides & conditions exact surf lesson times are not decided until the day before. Tip: If you are staying for 7 nights we always recommend 5 days of surf lessons. Start the day after you arrive so you don't miss any good waves! You can choose your surf days in the checkout. Situated on the south west corner of Ireland Kerry gets a lot of swell throughout the year. During the summer this calms down slightly but can still offer some waves in glassy green water, some of the cleanest in Europe. To surf in Kerry is an experience, from the mountains surrounding you on the Dingle Peninsula to the soft sandy cliffs of Northern Kerry. A land that offer some of the most beautiful landscapes to surf in the world. On the North side of the Dingle peninsula this 11 km run of beach curls around and offers many options depending on the wind direction. Mostly beach breaks, some notably spots here are Dumps, and the reefs Garywilliam Point and Mossies. Most spots work on all tides and pick up plenty of swell all year round. On the south side of the Dingle Peninsula Inch is a 6km long beach. This beach picks up lots of swell and is great for all levels. The beach offers nice long waves great for beginners and longboarding. Inch reef is known as the longest running wave in Ireland and when all the conditions are right can run for up to 400 metres. When the conditions are right watch out for crowds as this wave is somewhat mythical in the area and in Ireland. Out on the far west end of Dingle peninsula this beach break needs all the conditions to work. It can be tricky as it gets bigger and rips become a factor. When it does work it can be a magical wave to surf and feel like the edge of the world. Reanough and Ballydavid are two very different waves within Smerwick Harb to the North of Dingle Peninsula. Ballydavid is known as Kerry’s big wave and with the right conditions can be a real monster only for the professional and experienced surfer. Reanough is a beach break that works on a North swell and with South West wind. There is a reef at the East end that is rideable on high tide. This small town to the North of Kerry near the estuary of the Shannon river offers three great waves. A right that comes off a cliff and although can be hard to get up on rewards you when you do. The beach is great for beginners and works on all tides. The left that is on the South of the beach with a rock bottom. It is hollow at low tide and slightly mushy at high tide. A long beach that looks at the Dingle peninsula Rossbeigh is a fun beach break great for beginners. At the north end of the beach there is a left hand point break but requires a long walk out to it. My parents are originally from Ireland and after many years travelling the world, my husband Phil and I fell in love with the Dingle Peninsula and decided to make it our home. It is a very special place with an abundance of outdoor activities, inspiring landscapes and a thriving artistic culture. I am really excited to share this wonderful part of the world with our guests.